Namibia safaris are an incredible experience but it can be difficult to pinpoint where and with who you will find the best possible safari in Namibia. The trip reports, written and photographed by travellers who have already been on safari in Namibia will provide you with a good insight into what to expect on such a trip. You can find out where, and what wild animals were seen including some fantastic photographs. 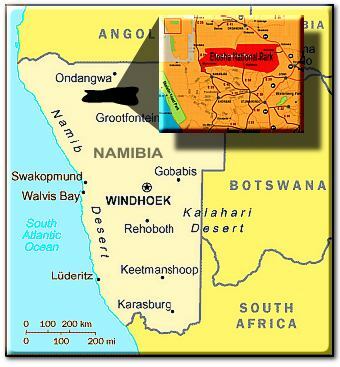 The travel reviews will give you an unbiased viewpoint on Namibian safaris. It often happens that the most valuable information you can get about a travel destination is from somebody who has actually been there. So don't be shy, read through other peoples experiences here and make use of what they learned to improve the quality of the trip to Africa that you might be planning. 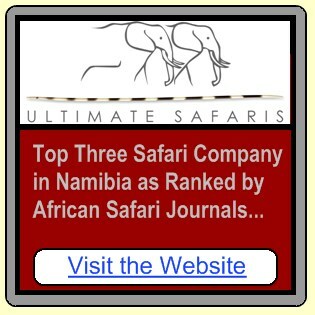 The Namibia safaris reviews let you find those nuggets of invaluable advice that could make a huge difference in the success of your dream holiday. Take a look at the reviews below and get advice, tips, recommendations right from the "horses mouth". The Etosha (satellite map and distance table) National Park is rated as one of the worlds greatest wildlife-viewing venues. It's one of the few places in Africa where you can even watch wildlife at night from the camp at one of the floodlit waterholes. Your chances of seeing most of the animals here are very good because there are only a few waterholes in Etosha for them to choose from. Request full trip report » Niamh and Cathal were impressed with Chameleon safaris and they recommend them for a Namibia safaris trip in particular for the fact that they only allow a maximum of eight people on the tour so you get all the benefits of being in a small group. 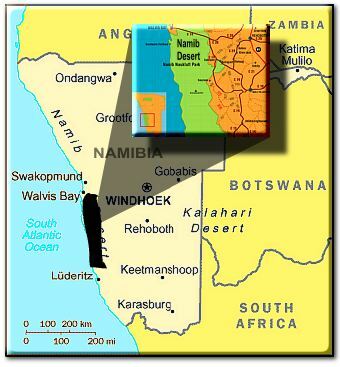 The Namib desert is one of the oldest and driest deserts in the world. The star attractions of the Namib are Sesriem and Sossusvlei. Sossusvlei is a pan lying amid sand dunes which reach up to 200m above the valley floor. Here you can spot gemsbok, ostrich and a wide variety of bird life if the pan contains water, which it does on an intermittent basis after good rains. The desert has its own characteristic beauty which can't be found anywhere else in the world as it's unique to this area. Request full trip report » One of the star attractions of the Skeleton coast is the Cape fur seals who have made a permanent home at Cape Cross. The colony numbers hover around 100 000 with the big bulls only resident during the breeding season which kicks off in October every year. Request full trip report » The Waterberg Plateau is so large that it dominates the landscape and Jayne felt that the accommodation was too close to the plateau which made it difficult to enjoy the view. Request full trip report » The baboons are very inquisitive residents here as became evident in the early morning when the whole troop climbed onto the roof of the bungalow making a huge noise in the process.